At the heart of any website copywriting process is you. From start to finish, your website content should be written using your voice and your brand message. Here at Custom Content Solutions, we believe that you’re an integral part of the copywriting process. We want to make sure you’re pleased with your website and that your copy goals are met. 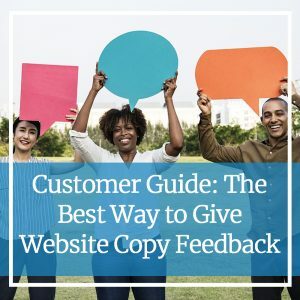 By gathering feedback from you throughout the process, we can make the changes needed to perfect your website copy. Before we get started on any project, we schedule an interview with you to go over your thoughts and desires for your website copy to ensure we’re on the same page. Content feedback throughout the process does the same exact thing, making sure everything is going as planned for your copy. But we know the thought of giving someone your honest feedback can induce anxiety. That’s why we’ve compiled some of our favorite feedback tips here to help you through the process. We understand that we don’t always get it right on the first try (even though we try our darnedest to do so). This is where your feedback comes in, giving us the ability to polish your copy into a final product you’ll be proud to publish. By following these three easy steps, you’ll be able to deliver your feedback in a manner that helps us get the job done right the first time around. Check for correct personal information: Make sure all contact information such as phone numbers and addresses are correct. This should include your demographic information such as your business name. Consider the voice and tone: How does the copy feel to you? Does the tone sound correct? Is it too laidback when you wanted more professional? Make sure you state this clearly during your review. Tell us what you love: Tell us what you love about your copy! This helps us get a better idea of what you’re looking for in the next round. Look for inaccuracy: Is there information in your copy that is inaccurate? Did we list a service you don’t provide? Let us know so we can remove and replace the inaccurate information. Look for areas of confusion: Is there something in your copy you don’t understand? If so, let us know. Chances are, your customer will find it confusing, too, and we should rework it. It’s important to focus on giving feedback about quality. Don’t be afraid to tell us what you’re not yet happy with. Even if you don’t understand why something isn’t quite right, let us know. We’ll work together to figure it out. Another point to remember is your very first review is about the big picture. Don’t focus on copyediting or proofing at this stage. We want to the get tone and message right; then we’ll run a final copyedit and proof to make sure your copy is clean. Use whatever method is most comfortable for you and we’ll handle the rest. Step 3: Multiple Parties Giving Feedback? This Step’s For You. If you’re part of a team with multiple parties giving feedback, appoint a lead individual in your office to combine all feedback into one document/email/etc. This will make sure nothing gets missed and a cohesive edit can be delivered on the next round. Although giving feedback is sometimes hard, it’s necessary to ensure you have content that captures your essence and achieves your goals. If you have further questions, feel free to reach out by calling our team at 612-643-1824 or send us a quick message.